A one dimensional ranking of features utilizes a ranking algorithm that takes into account only a single feature at a time (e.g. histogram analysis). By default we utilize the Shapiro-Wilk algorithm to assess the normality of the distribution of instances with respect to the feature. A barplot is then drawn showing the relative ranks of each feature. A two dimensional ranking of features utilizes a ranking algorithm that takes into account pairs of features at a time (e.g. joint plot analysis). 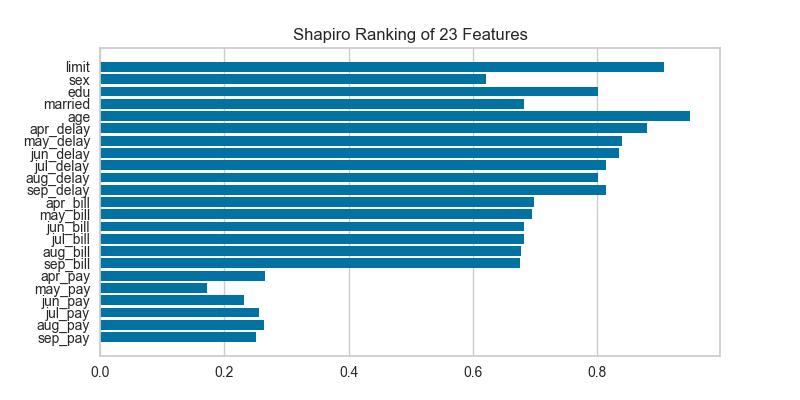 The pairs of features are then ranked by score and visualized using the lower left triangle of a feature co-occurence matrix. 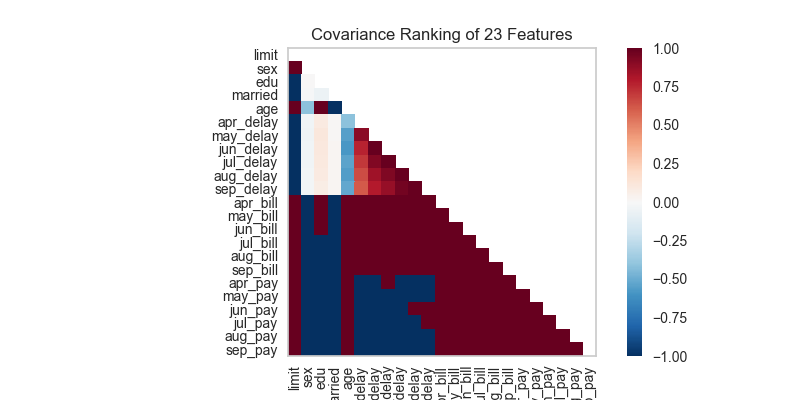 The default ranking algorithm is covariance, which attempts to compute the mean value of the product of deviations of variates from their respective means. Covariance loosely attempts to detect a colinear relationship between features. Alternatively, we can utilize a linear correlation algorithm such as a Pearson score to similarly detect colinear relationships. Compare the output from Pearson below to the covariance ranking above. The ranking algorithm to use, default is Pearson correlation.